As I started to work on this review, I realized something shocking. 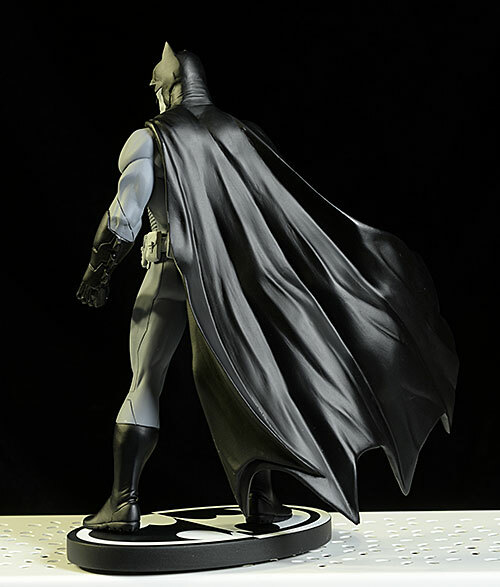 Do you realize the Batman Black and White series of statues have passed the 10 year anniversary? A decade! That's an amazing run, something I don't think any non-action figure themed collectible series has ever done...I'm sure a reader will write me within 30 seconds to point out where I'm wrong. But until then, I can't think of another. I realized something else shocking - I haven't reviewed one in almost two years! How is that possible? I still buy them all. At least I *think* I have them all. I'm going to need to dig up a complete list somewhere on line and do a double check before too long, just to be sure. But I have gotten plenty of them in the last 24 months, and somehow never found time to review any. 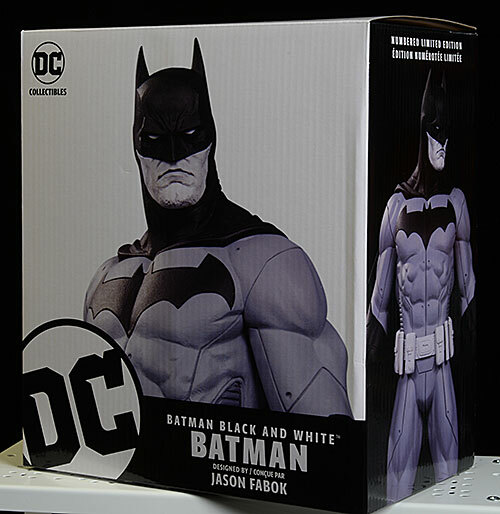 That changes tonight, with a look at the new release based on Jason Fabok's artwork. If you don't know Fabok, that probably means you aren't reading the New 52 Detective Comics. He's also worked on the Justice League and Suicide Squad titles, and he does some other titles for Aspen as well. 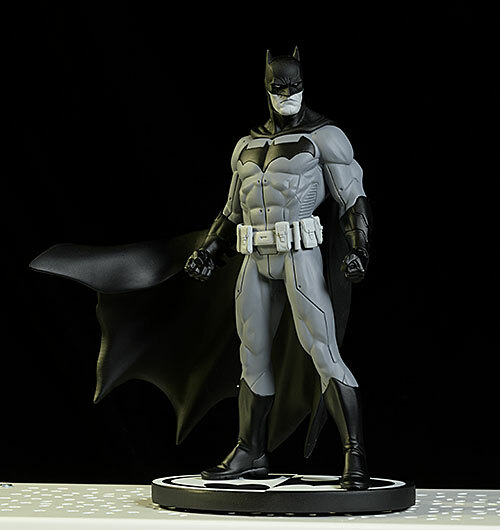 This statue will run you around $70 - $75, similar to other recent Batman Black and White releases. Nothing special here, but it does keep the two piece statue - figure and base - safe and sound inside the high quality foam eggshell trays. This is not a limited edition, so no numbering, and no Certificate of Authenticity. Let's get this out of the way right up front - I'm not a fan of the New 52 look. The sculpted lines and indents look like something an 80's designer would call 'high tech'. However, this statue makes up for it with a fantastic pose, great expression, a beautiful, dynamic cape, and tons of attitude. Add in some very nice detailing on the various pouches on the belt, and you have a winner for me. I particularly like the pose. The expression matches it, and every aspect, from the turn of the head to the pose of the hands, emotes just the right realistic badassery. The object of his unhappiness is about to find out just what that means. This statue stands about 8 inches tall, including the base, fitting in nicely with the rest of the series. I wish the paint were a *little* better, particularly on the lower face, but overall the quality is well above average. 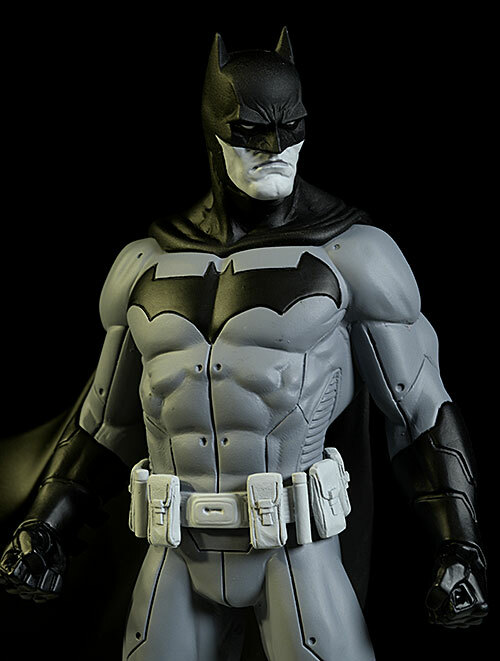 The work on the suit and belt is great, with sharp lines, clean edges, and no slop. There's not a lot of paint detail, and there's not even a lot of variation in the palette - there's black, one color of gray, and white - but it's all quite clean. I do think the work on the mouth and lower face could be a little better, and the lips tend to stand out too much on the light skin. But it's a minor nit in an otherwise top notch paint job. 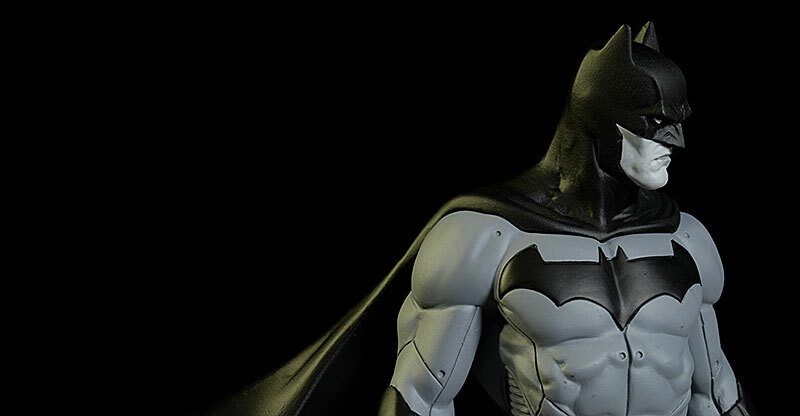 When I last reviewed a Batman Black and White statue it was $70 - and that was two years ago. Great to see them maintaining the price point over time, with no drop in quality. Not a thing. The metal post on the bottom of the right foot is square, so pay attention to the orientation when you slide it in. Mine never quite seated all the way done, but in hand it looks fine, and forcing it is never a good idea. Otherwise, you should be cool. 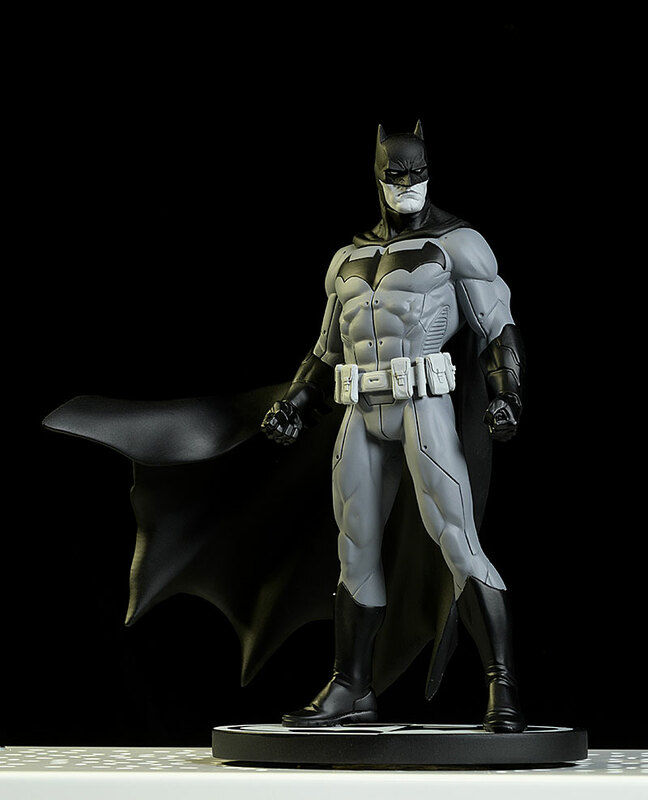 I've been - or at least was - a pretty vocal critic of the New 52 Batman suit design. 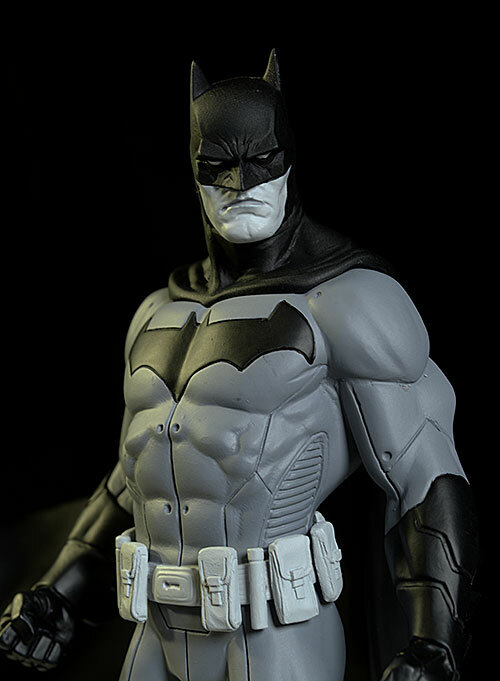 I'm still not a massive fan of the Tron influences, but this statue is one of my favorites in the series in quite some time, at last from a pure Batman perspective (I really like the recent DKR Joker too). The pose works great, and he's a stand out on the shelf, even with dozens and dozens of other versions around him. - also has him at $70. - Entertainment Earth sticks with $70. I can't believe it's been two years since my last Batman Black and White statue review...that was the Sprang Joker and Batman, btw. 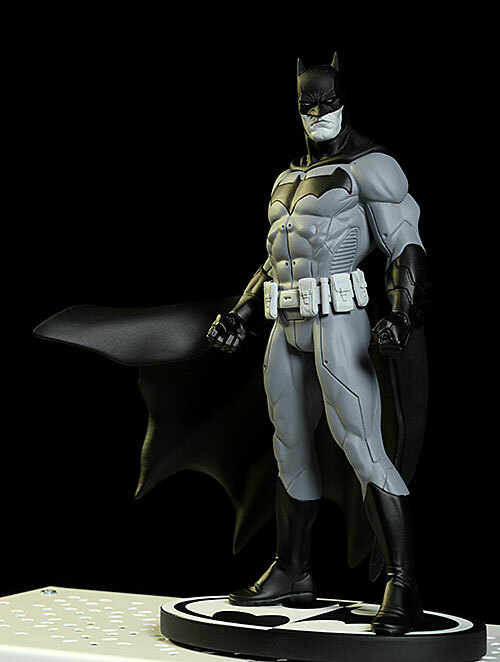 Before that, there was the Jae Lee version, the Zombie Batman, the terrific Harley, the Earth 1 and 2 Batmen, the Capullo Joker, Allred, Bane, Batman Beyond, Bolland Joker, Jock and Cooke versions of Batman, New 52 Jim Lee Batman, Sam Keith version, the Mignola variant, the humorous version based on artwork by Sergio Aragones, the Gleason and Chiang versions, the Finch version, the Bermejo Joker, the Tony Daniel Batman, the Arkham Asylum version, the cool Man-bat, and don't forget the other black and white Joker from Jim Lee.